Brooks' marketing pitch: Equal part cushion, support and balance. Upper: Spacer mesh, synthetic leather, molded TPU. 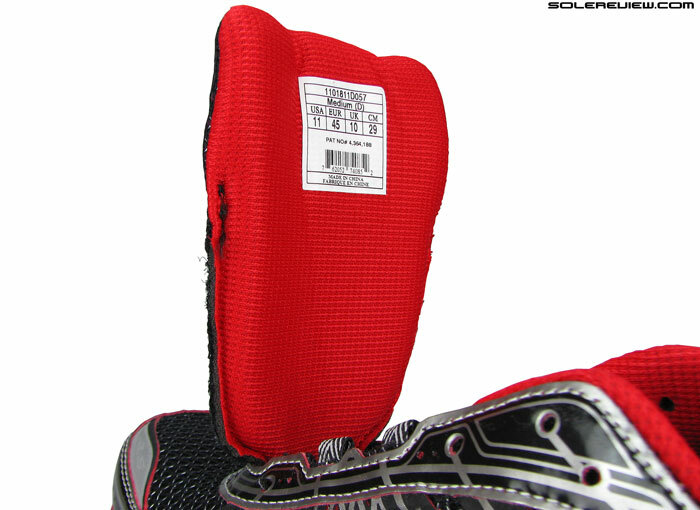 Midsole: Quad density compression molded EVA, which includes a harder medial post. 12mm heel drop. The GTS 15 is a competent, stability shoe alright, but significantly altered from GTS 14. The upper's much tighter, and the ride's firmed up. 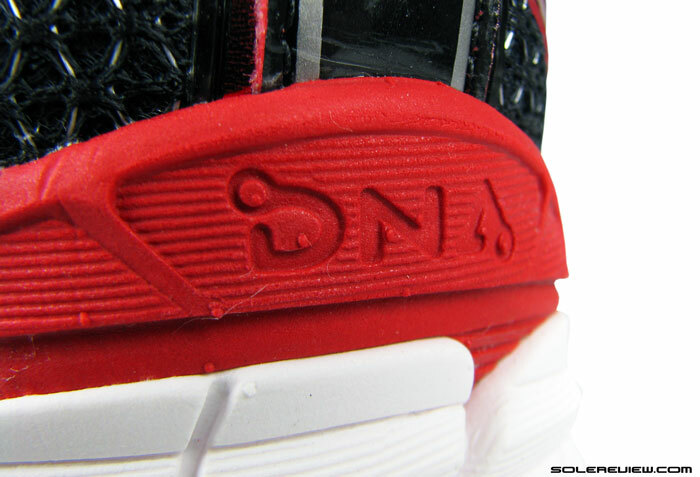 There is no more of that DNA gel inside the midsole. Smooth ride, lightweight, stability, quality materials. The 15th version is a different shoe altogether when compared to GTS 14. Like any other shoe model which has been around for many years, your opinion of the GTS 15 will depend on whether you’ve run in its previous version or not. Runners who wear the GTS for the first time will experience a snugly fitting shoe with a firm and stable ride, blended with pronation control manners. A well rounded shoe if you’re exploring the territory occupied by other alternatives such as the Saucony Guide 8, New Balance 1260V4, adidas Sequence 7 and Nike Structure 18. Like the GTS 14, this one aims to deliver stability, cushioning and motion control together as a package. On the other hand, if you’re going one up from the GTS 14, then you will find the ’15 to be a very different animal. The sizing runs half size smaller, upper is much snugger, and the midsole foam isn’t as cushiony as it used to be. At least, that’s the gist of it, although there are other changes which make the GTS 15 what it is. And what brings about the noticeable change in Adrenaline GTS 15’s character ? Result of quite a few things teaming up together. Since the upper fit has changed drastically, it might be a good idea to warm things up by talking about it first. Line up both the GTS 14 and 15’s insoles, and the length will be the same. So why the difference in sizing? Same last markings as 2014 edition. So the last hasn’t changed, either. We bet one of the first things you’ll notice when you slip into a pair is that the shoe has shrunk by half a size, and also that the forefoot and midfoot fits tighter. Pull out the removable, molded foam insole and measure it against the GTS 14’s. The length is identical, as expected of two shoes which share the same size. We knew this already, but wanted to call out the fact that even in circumstances when the shoe size feels smaller or bigger, the actual length never varies. After all, US 11 is the same across a single brand no matter what, with no empirical deviations. 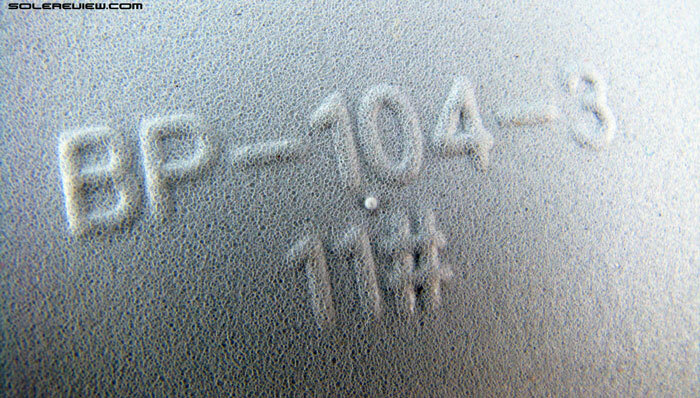 We also believe the last to be the same across, going by markings (BP-104-3) on the insole. 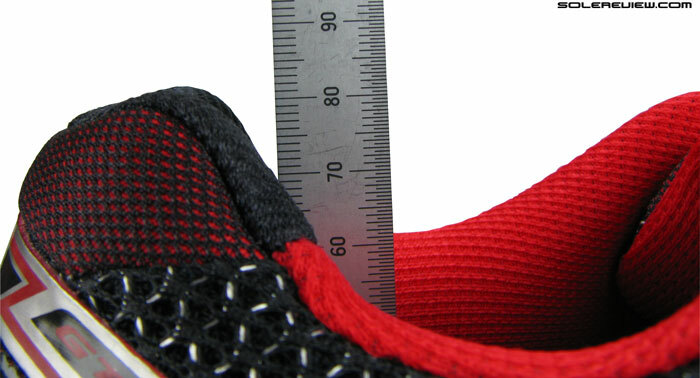 So if the metric length has remained unaltered, what’s causing the shoe to feel smaller? The heel counter molding has a more pronounced inwards curve, pushing the foot forward. Achilles dip is also firmer owing to the synthetic overlay wrapped higher. Anything will move forward if force is applied behind it, and that’s exactly what happens inside the GTS 15. Compared to the good ol’ 2014 GTS, the heel counter molding curves more inwards, pushing the foot slightly forward. That results in a shortage of space ahead of the big toe, and hence making the shoe feel half size smaller. We’ve also seen the reverse apply in some shoes, where an accommodating heel counter has the foot sitting further backwards, and creating room upfront. That’s not end of it. The forefoot has two more updates which increases snugness in that area. 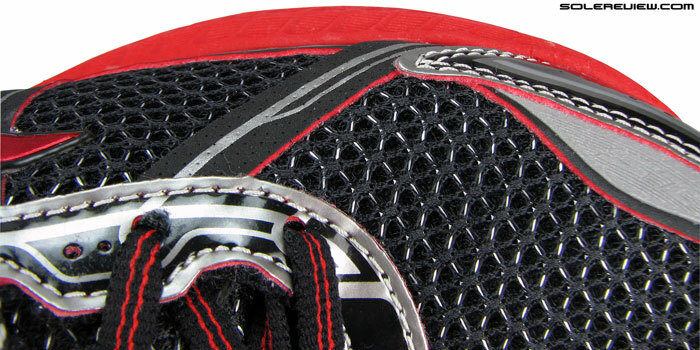 First and foremost, both sides have a centimeter wide band of synthetic leather going over the mesh. That’s not unusual, being standard design practice, but it contrasts greatly with how the GTS 14 was designed. 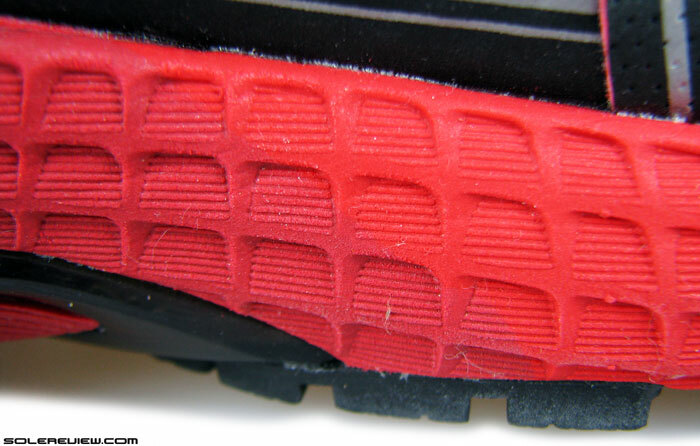 That shoe only had thin strips (see image below) of fused urethane running over, and that too more towards the top of forefoot than on the sides. That helped create some room for splay. 1) Mesh change, and forefoot feels half size smaller 2) Lacing extends further over toe box; lacing gap increased both ways; speed loops introduced in midfoot; laces are now flat. 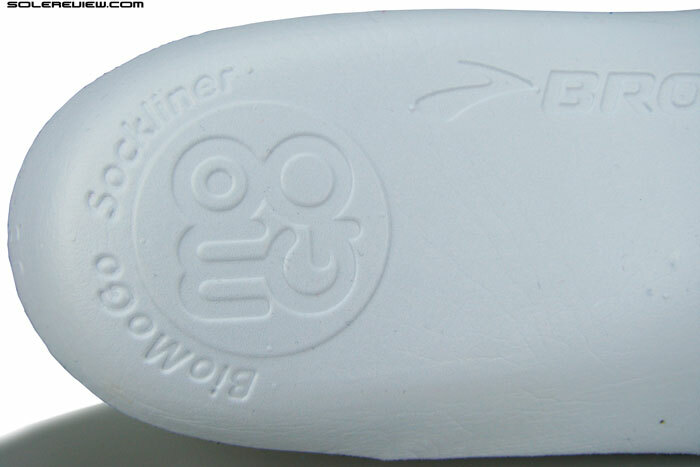 3) Heel counter is molded inwards, pushing the foot forward into the toe box. The other thing to take into account here is the change in lacing position. From a functional perspective, the GTS 15’s lacing effectively starts around 5 mm closer to the toe tip than the ’14. 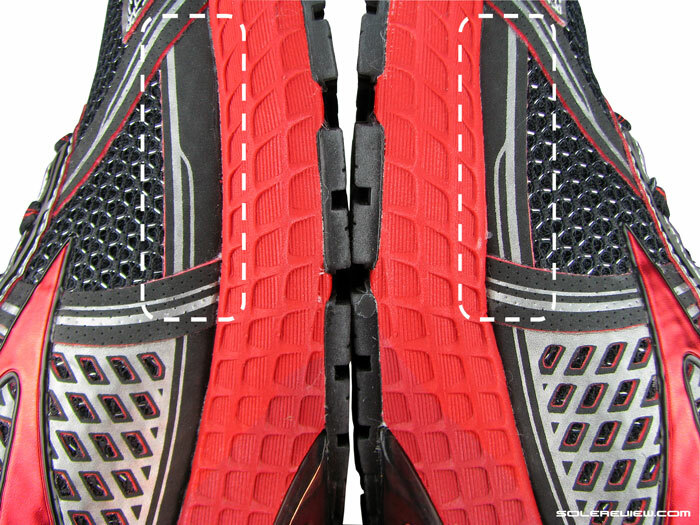 And we say functionally because technically the GTS 14’s lacing is closer to the front. If you’re confused, don’t be. 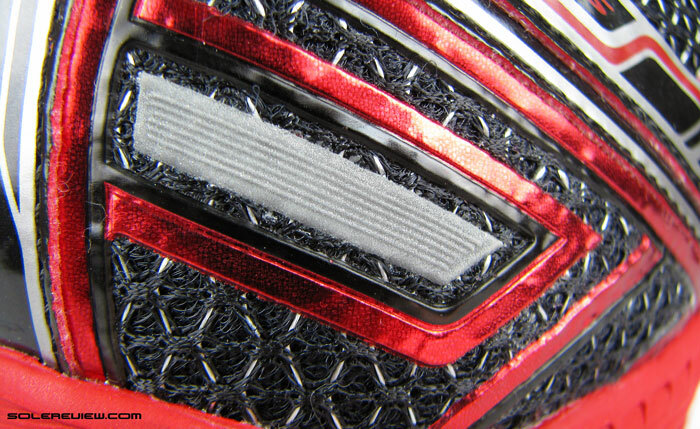 The picture above helps us remember what the lacing on the GTS 14 looked like – the first row of lacing was connected to a loop in the front. This eased off the pressure a bit. Adrenaline GTS 15 doesn’t care for such niceties, and the front row lacing comes minus the loop. 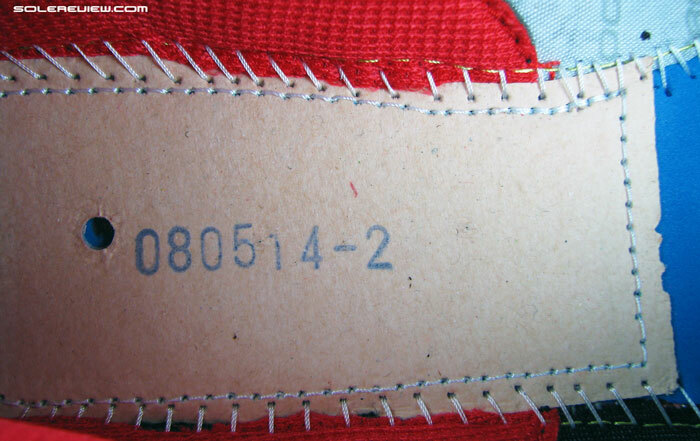 This also means that the eyelets are moved forward, moving the lacing pressure with it. As a consequence, the forefoot feels shallower and snugger. There is a workaround for this, though. If you need more splay room, all you have to do is to skip lacing the first row of eyelets. And if you were thinking that the unused lace portion will end up being too long, fret not. The GTS lace length is optimal, meaning that it doesn’t feel too long even after skipping one row of eyelets. No slapping around the sides. So you can either do that, or go wide (2E) or extra wide (4E) in the new Adrenaline. Flat and semi-elastic laces like the Ghost 7, and midfoot lacing is cinched through a set of twin speed loops. 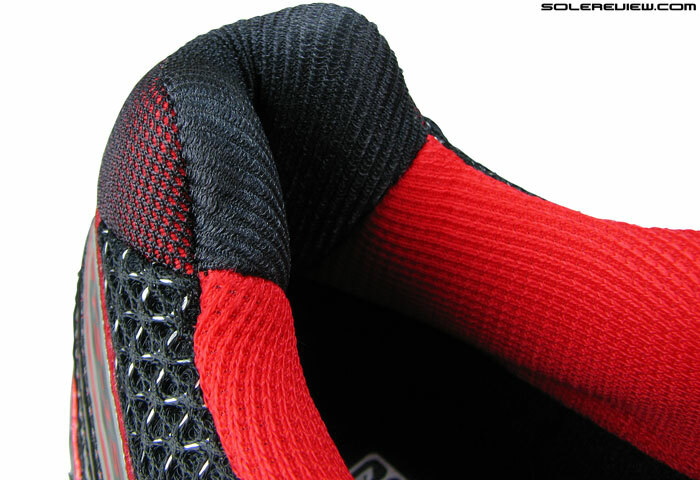 The shoe retains six main rows of lacing (seventh being the back-up one), like the GTS 14. But since the first row is moved forward, lacing rows now have more space separating them. Coupled with that is the increased width between opposing eyelets, and introduction of two speed-lacing loops right in the middle. The wider spread lacing in both directions puts more top down pressure on the foot, and things like flush fitting speed loops and flat laces (GTS 14 had round ones) only help make the midfoot lockdown more effective. Lateral midfoot looks cleaner now, with the welded ‘fingers’ gone. Glossy synthetic of GTS 14 has been interchanged with a perforated panel. Additional layer of internal lining – only on the arch side. The lateral side loses the welded cage of the GTS 14, and glossy medial piece of urethane is replaced by a perforated synthetic panel. Makes the ’15 look cleaner visually, not that it makes a difference functionally. However, all those updates around the lacing area more than compensate for any decrease in snugness these side panel redesigns might have caused. Left and right pair manufacturing inconsistency. Notice how the right shoe has a shallower forefoot side panel. Upper of the GTS 15 suffers from the lack of manufacturing finesse which we’ve encountered recently, in shoes like the Ghost 7. In Adrenaline’s instance, the lasting inconsistency is visible on the medial side of upper forefoot. See the dimensional difference of materials rising up from the midsole edge? It did not cause any problems for us, but we’re putting it up here so people from Brooks can see it. Hopefully. Tongue is standard design, not attached to the sides. Materials are high specs, soft lining below and spacer mesh on top. It also carries over the very handy ’tongue tied’ loop, which prevents slide. 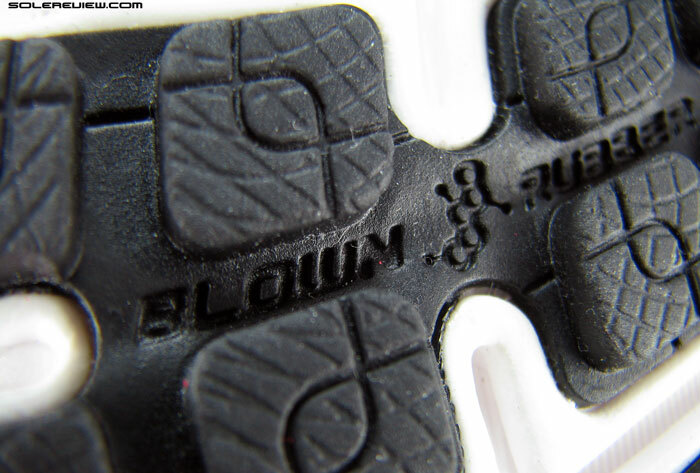 Laces are switched from round and plush to flat and stretchy, same as what’s on the Ghost 7. 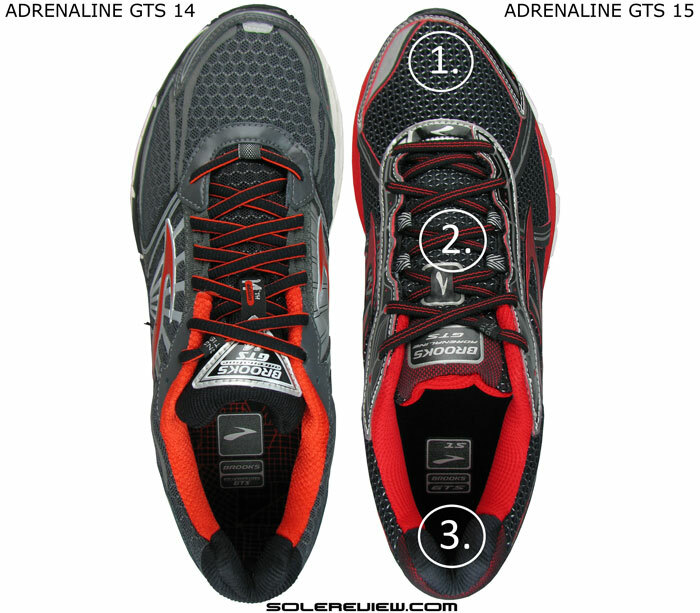 We pointed out earlier than the heel counter had an increased inwards curve compared to GTS 14. The collar is snugger fitting as a result, specifically the area around the Achilles. The materials have also been changed, but no impact from performance viewpoint. 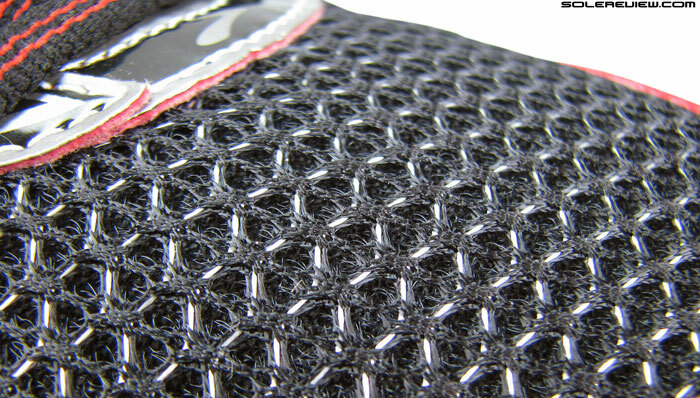 Soft dual lining – one type of mesh lining the Achilles and another around either sides. The Achilles dip is firmer than the GTS 14, as the synthetic leather panels wrap higher over the outside heel. Reflectivity is scaled down on the heel, but increased on the toe-box, which kind of makes it even. The GTS 15 (right) upper looks higher than the GTS 14’s. But collar height is the same. Only midfoot stack heights have risen. When stacked heel to heel, the GTS 15 collar walls appear higher than 14. When the actual height was measured using a scale, it was the same across. It just so happens that the midsole is higher this year, and we have a theory on that. That theory happens to be this: Brooks’ DNA gel, a midsole cushioning insert last seen on the GTS 14 is now missing, presumed lost forever. In its place is a piece of foam which the Seattle based company calls ‘BioMoGo DNA foam’. 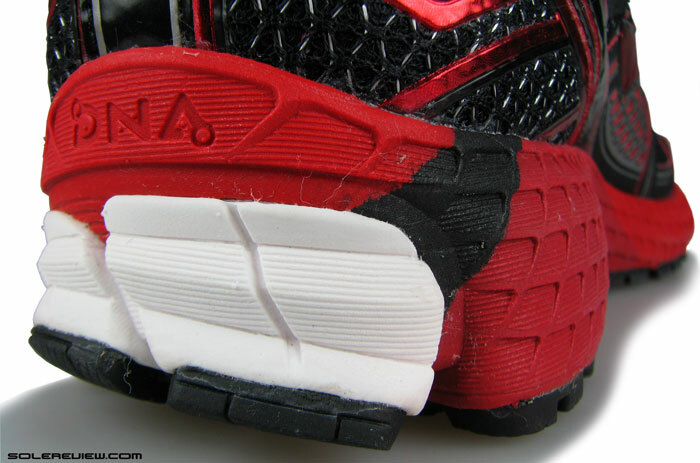 Since the actual Gel was more cushioned than foam, Brooks now needs a higher volume of foam to come close to the level of original DNA cushioning, and hence the higher stack height. Brooks says that the BiMoGo foam is blended with non-Newtonian DNA material. Non-Newtonian materials are those which change density based on how much force you apply on it. These kind of materials are also called ’shear-thickening’ compounds. Brooks also claims the new ‘BioMoGo DNA’ foam to have ’30% more cushioning’ than Gel or regular midsole foams, and ‘twice as much’ energy return. Except that none of all that is apparent when running in a pair of GTS 15. BiMoGo might be biodegradable, landfill friendly and all that. Nice job, Brooks. But calling the BMG foam non-Newtonian is utter nonsense. We really don’t care if their laboratory tests showed an infinitesimal amount of shear thickening behavior, because during runs it is not effective. And we know how real non-Newtonian foams behave like. BMW motorrad uses the NP-2 foam in back, elbow and knee protectors, and that, my friend, is the real deal. Not the stiff foam which Brooks claims to possess miraculous powers. We call vaporware on DNA part of the foam. 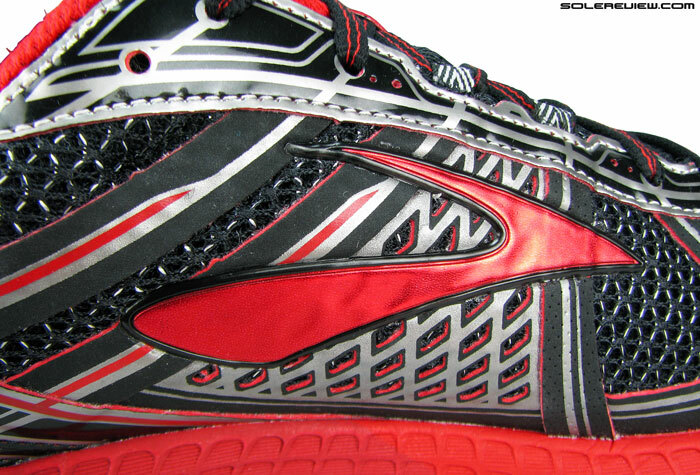 It is as disappointing as Saucony’s ’new’ Powergrid+ midsole seen on the new Triumph ISO. Notice the slight color variation between two reds. One in the front is softer, while the darker red is the hard medial post. These foam layers are ‘co-molded’ instead of being glued together. 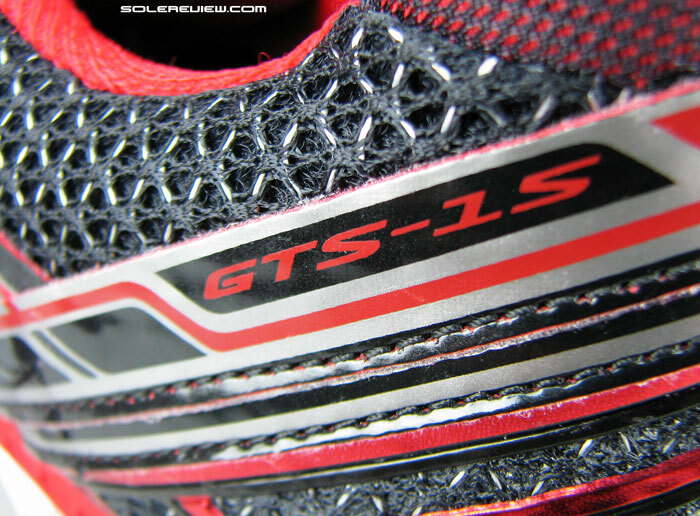 If you don’t read all that marketing fluff and treat the shoe sans lofty expectations, the GTS 15’s ride is pretty good. The midsole is mildly cushioned, definitely firmer than GTS 14, transition comes smooth. Adrenaline being a pronation control shoe, has four densities of foam, three of them co-molded together without adhesives. 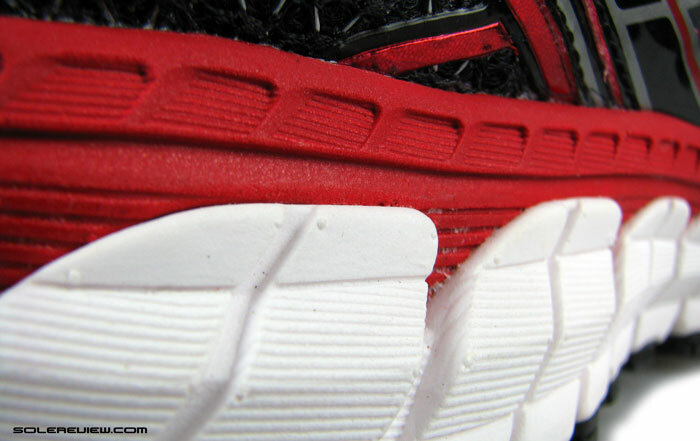 The white foam is a separate piece of foam glued to the rest of the midsole. 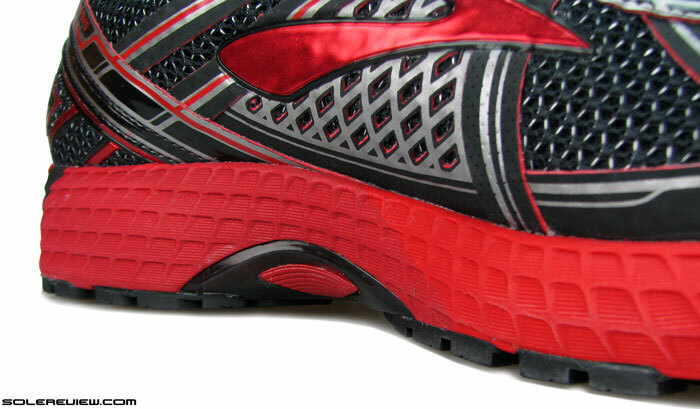 And like any motion control shoe, the foam layers go soft to hard, progressing from lateral to medial side. With the midsole no longer featuring a DNA gel embed, Brooks makes some significant changes to the midsole design. The most visible of which would be the foam crash pad on the lateral side. As opposed to the heel only location of the GTS 14 crash-pad, the new foam section spans all the way around from medial midsole to lateral tip. This is meant to improve transition. Like we mentioned before, the GTS 15 rides smooth, though the difference from a GTS 14 is minimal from an usage perspective. The 2014 model was already a very smooth riding shoe. Turn the forefoot over to see a dual density construction, moving from a single foam design of the ’14. 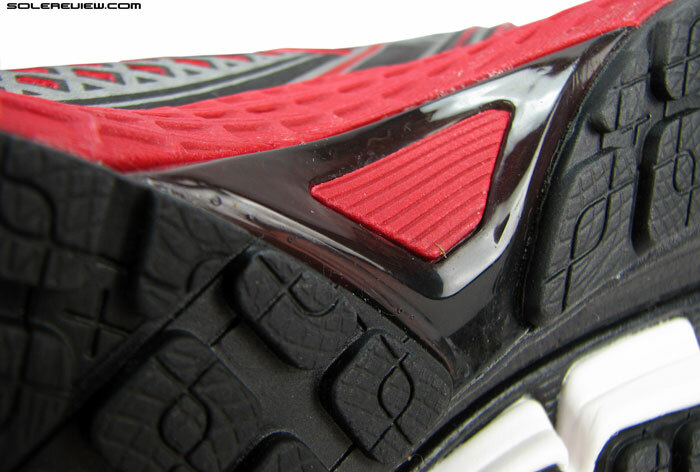 Again, hard to say whether that results in improved ride, complex midsole engineering nevertheless. The forefoot flexibility is lower this year, more stiffer than the already stiff GTS 14. Foam density has been made firmer all across, and is another reason why the GTS 15 rides less softer than Adrenaline 14. The removable insole and faux combination board lasting in heel is carried over from 2014. Faux because it isn’t true combination lasting; the thin sheet of cardboard is stuck on to a EVA sheet below. One area where the increased firmness makes itself noticed is the medial post. Medial posts are firm by nature, yet the one used in GTS 15 is even more so. Crudely put, if the GTS 14’ medial midsole felt as hard as a piece of wood, then the GTS 15’s is a rock. It is also comparatively early stage, meaning it extends further into the heel. This affects the motion controlling behavior of the shoe, as the harder midsole foam is felt more during transitions versus the GTS 14. But given there’s all around firmness, the pronation control is that of mild intensity, with no lateral lean seen in some shoes such as the New Balance 860 V5. No lateral lean and firm ride also makes the GTS stable. It is taller than last year’s model, but that has no bearing on stability. The heel feels very grounded, and the flared forefoot does its part in making the front planted. 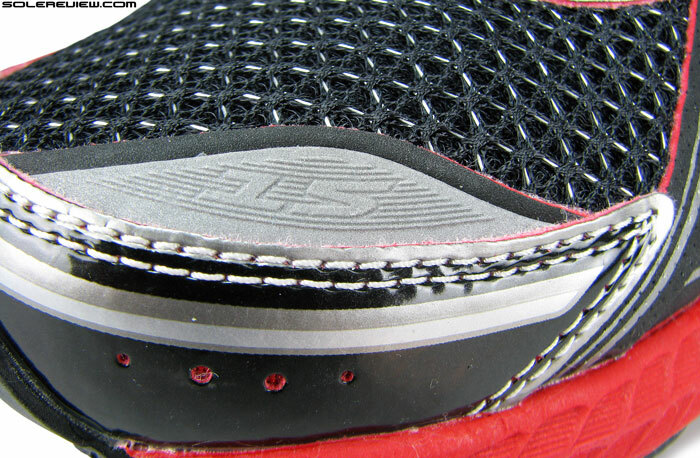 The GTS 15’ outsole maintains a similar layout of rubber and flex grooves, except for two areas. The midfoot shank size is reduced, and the gap is filled with rubber. Outsole waist has been made slimmer as the rubber pieces sit further away from the edge. This is something which we noticed visually, and did not feel out of sorts during the run. Secondly, the position of the crash pad groove has shifted further into rear-foot. This helps the heel section break away more efficiently during foot-strikes, and also adds to the cushioning feel. This tries to make up for the loss of DNA gel, somewhat. The takeaway of all this is that the GTS 15 is a slightly cushioned shoe which offers both stability and motion control, with a snug fitting upper package. It uses top notch materials, everything seems well glued and stitched together. 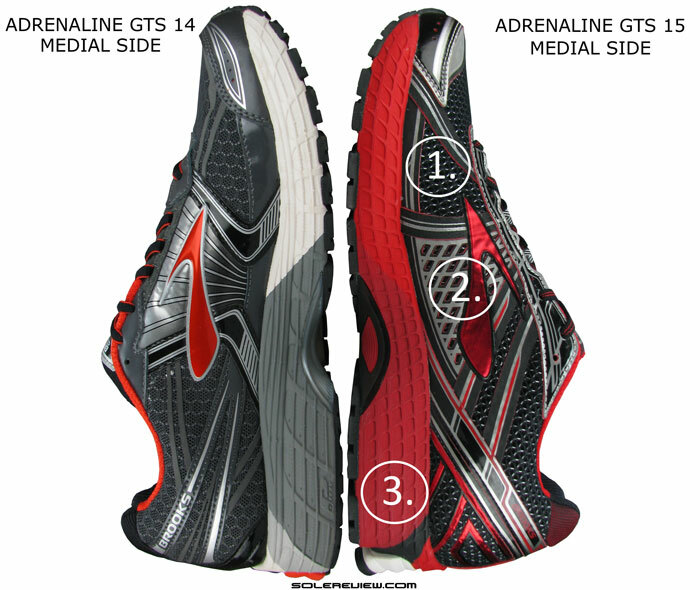 However, existing GTS 14 runners need to know that the shoe has changed, and hopefully, our review has done a fair job of laying it all out for you. Whether you like the Adrenaline 15 or not is a matter of personal choice, but one thing’s for certain – buying half size larger will be warranted in most cases. We were expecting the shoe to go lighter because of DNA gel disappearing, but that hasn’t happened. The weight is exactly the same as last year, and so is the retail price. Looking to upgrade your old Adrenaline GTS 14 to the latest version, but not sure how the 2015 model compares? We can help here. The following infographic is a ready-reckoner for what changes you might expect in the new model vs. old. To make this more fun, we’ve put in a system of percentage match, which calculates a weighted average for a set of attributes. It´s a great, honest and detailed review and it coincides with the observations by others. By what I´m reading, I´m shocked that Brooks seems to be on the cost cutting and quality lowering route (like many others). The quality standard of Brooks models seems to be deteriorating. 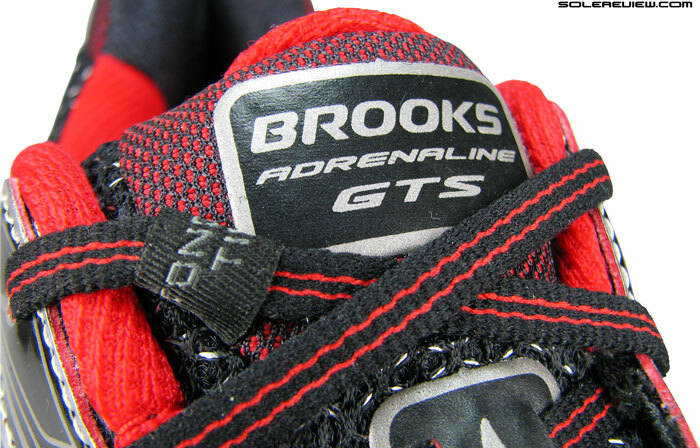 I always liked Brooks shoes, my first favorite shoe was the GTS 7 and their quality always has been top notch… It´s sad to see where things are going, though. The scoring system, by which you mean the bar graph thing? We can bring it back only when we put a detailed section of how we score shoes – otherwise the bar ratings did not make any sense to a lot of people, and solereview is to blame for that. Yes, every brand seems to be under margin pressure. 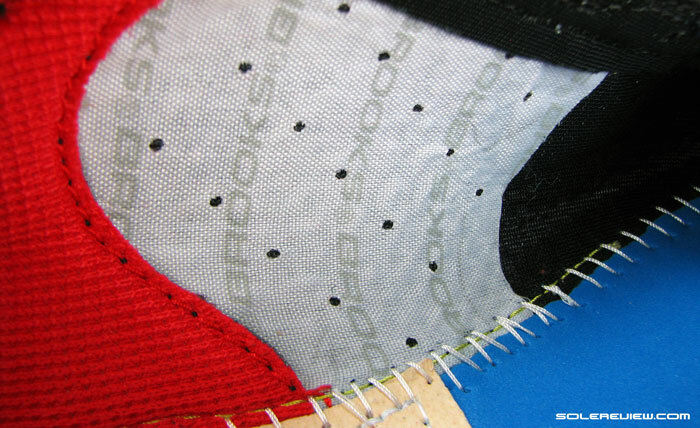 That said, we still think Brooks uses a lot of quality materials not found in any other running shoe brand. You’re right, we delayed posting the scorecard by an hour after we discovered a small error in it. Thanks for the suggestion, we’ll try our best to put up a detailed section outlining the scoring mechanism. To be honest, we don’t like the GTS 15 that much either. But that is a subjective opinion, and our scoring is designed such so that functional areas are given higher priority. Funny how that works sometimes, right? A shoe (or anything else in life) might objectively “tick all the boxes,” yet it just doesn’t sit quite right with us or isn’t our favorite. Having said that, what would you say have been your three favorite motion control/stability models from this past year so far? Our three favorites would be the adidas Supernova Sequence 7, New Balance 1260 V4 and the Brooks Adrenaline GTS 14. Yes, the heel section is far stabler in the GTS 14 and Sequence. Heel section is far stabler in the gts 14 than Sequence? No, we meant that GTS and Sequence has a stabler heel than 1260. 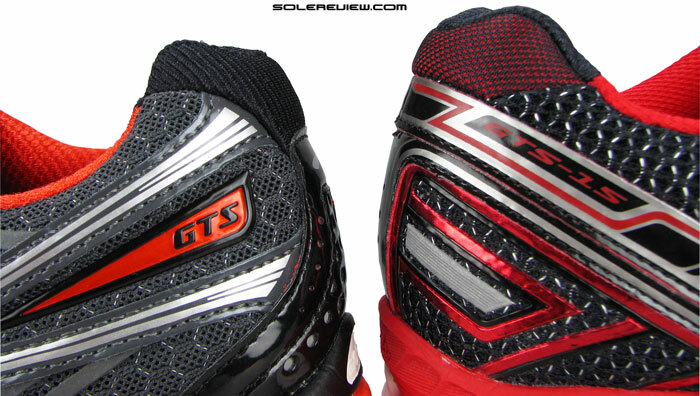 The GTS 14 and Sequence are pretty close, though we feel adidas to be slightly more firmer. Hello, I am currently wearing New Balance 990V3 since Aug and pretty much worn them out. Recently I have been to Dr and they said I have very low arch (and hence the pain in ankle area diff story though), and overpronator as well. I was looking for new shoes and has kind of narrow it down to but not limited to Brooks beast 14, Brooks Adrelaline GTS 15, NB 1260 V4, Asics Gel Kayano 21 and Asics GT-2000 3. Does GTS 15 offers better stability then any of the other shoes? or are there any other shoes which are better at stability then above listed ones. I am a heavy guy and run 2-3 miles per day. Ultimately I am going to go to a specialty store and buy after trying them out but I am trying to limit my trial choices. Thanks. The Beast 14 and 1260v4 is what we recommend for heavier runners. Beast 14 looks best in motion control but its almost 100 grams more heavy then 1260v4 or GTS 15 and also it feels more rigid then rest two. Do you think that weight vs stability tradeoff is justified in this case? Also, What do you think about Saucony stabil CS3 comparing to these three? ps – Ideally, I am really thinking of giving brooks a try because of all good things I have heard about their shoes. That order is listed purely in order of stability, so did not account for weight. The extra gram’s also what gives the Beast its planted, solid character. If you want something lighter, then the GTS could be the way to go. Haven’t tested the Stabil, so can’t help on that! Thank you for the comment, but would be unable to help since we haven’t wear-tested the 990. Sorry about that! Gutted to hear the cushioning isn’t as good as the outgoing GTS 14, I was set on replacing mine with the newer model. Think I’ll be looking into the Kayano 21s. Thanks! The cushioning’s there, but the depth is missing. After all, foam is foam. Kayano 21’s are very different – much softer, and less of a support shoe. Thanks for the heads up! Happy to take some advice on what’s best for me. I’ve run in a few trainers, the best being Nike lunareclipse 3+ and the GTS 14 but felt the Brooks could do with more cushioning. Based on the Brooks shoes we’ve reviewed so far, our impression is that their cushioning is always very layered and subtle – a ‘just there’ kind of feeling, if you know what we mean. Things could change though. 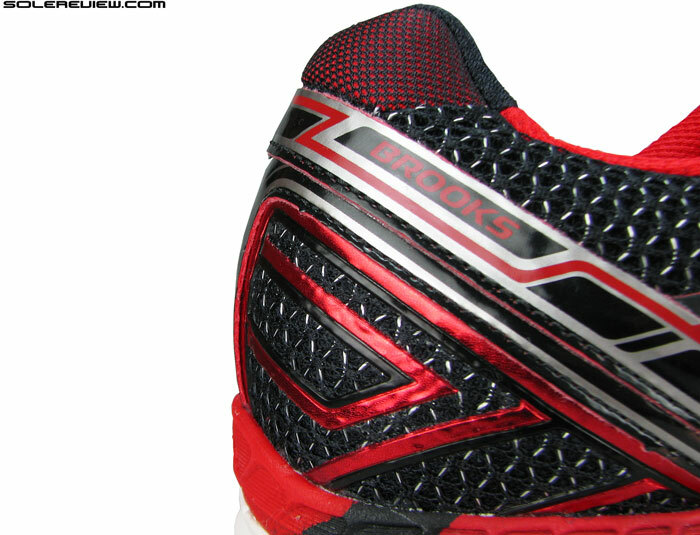 The Brooks Transcend is nicely cushioned, and perhaps a precursor of things of come. Hi, my name is claudio, I write from Italy. I am 178cm and relatevely light weight – 70kg. My pace is around 5min/km. Many thx for your reviews, very comprehensive and really appreciated. My story with shoes so far is a real struggle: nimbus 15 and energy boost 2; with both after long runs I have a sort of soreness to both my knees, no specific pain. So i made a test on the treadmil and the guy told me that i am a pronator so suggested me the New Balance 860V4. First 4 runs ok, no knees pain at all (16km + 12 + 10), but during the fourth run I felt something was wrong with my right knee (external side). It is now three weeks that I stopped running; every sunday I try but after like 30 mins the pain comes back so I stop to prevent further injuries. My question is: i feel with these shoes I run too much on the external side of my foot. Can these shoes be too much for me in terms of motion control? Maybe I should switch back to neutral shoes? I was thinking also based on your reviews to 3 shoes: nova glide 7, pegasus 31 or lunarglide 6 (for moderate pronatore as far as I understood). Can you advice pls? It is frustrating when you really want to run but your body cannot for some reasons that I cannot actually understand. Based on your experience, the adidas Supernova Glide 7 is a safe bet. Not too much cushion, and provides stability too. We also think that not all of your problems are related to footwear, but perhaps a need to include a higher level of physical conditioning. If you want to take the load off the knees, target your quadricep muscles, Hamstrings, Glutes along with exercises for calves, shin, Achilles and PF. What kind of exercises are you currently including in your daily routine? Note: yes sorry, I did! my bad, won’t do it again! Thanks for your reply. Actually I am doing a lot of gym, both on my upper and lower body. I am doing leg extension, leg press, calves machine….). I have increased it now that I cannot run, and I have also added a couple of sections of bicycle on my weekly routine. Re. the shoes; thanks for the advice. Do you think the Glide are a good choice even if I was found being a moderate pronator? Based on your review, I was choosing the lunarglide 6 to be honest: good cushioning, light weight, but with a little bit of motion control. And a very high scoring too. So I thought those were very good shoes perfect for my case. Probably I am wrong then. Do you think is better to go for neutral shoes? or the glide can be considered enough for a mid pronator? Thank you very much, and apologies again for pushing my question on both pages. It is always useful to include strengthening and stretching exercises in your routine, helps run injury free. Always hard to say why some shoes lead to pain and others don’t. 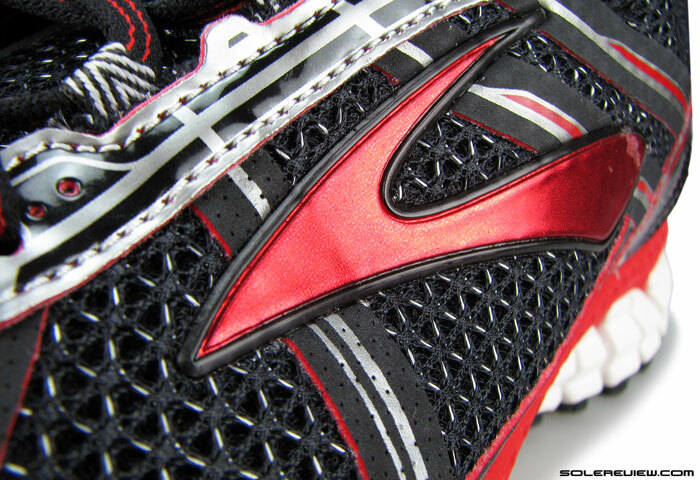 The Supernova Glide 7 is not overtly cushioned, so it should do fine for a large percentage of runners. If you need more support, then you’re right in considering the Lunarglide 6. Also try the adidas Supernova Sequence 7 and the Saucony Guide 7/8. Might also be useful to vary your running surface. For example, if you are running only on the treadmill, then try running on flat sidewalks/roads with no camber (curve). Hello, thank for all the extensive reviews here…great work! I was hoping you could give me some insight. I’ve learned so much about stability and motion control through your reviews. After years of run injuries in all sorts of neutral shoes (I was told I was a supinator), I’m now switching to stability models and it’s been working out great. 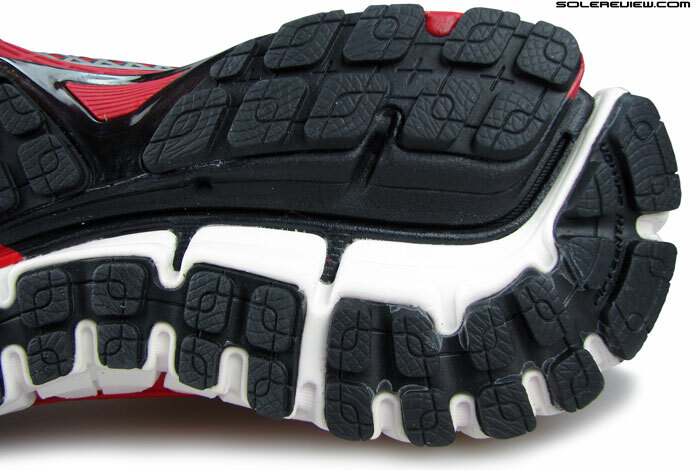 My question is, for a runner (50+ miles/week) who always wears his soles out on the far lateral edge of the heel, and then over to the far medial side of the forefoot/toes…would you recommend a mild/moderate stability shoe, or an even more stable platform? There’s absolutely no sole wear on the opposite sides of the heel and forefoot. Is that odd? Thank you for the comment, Fran. 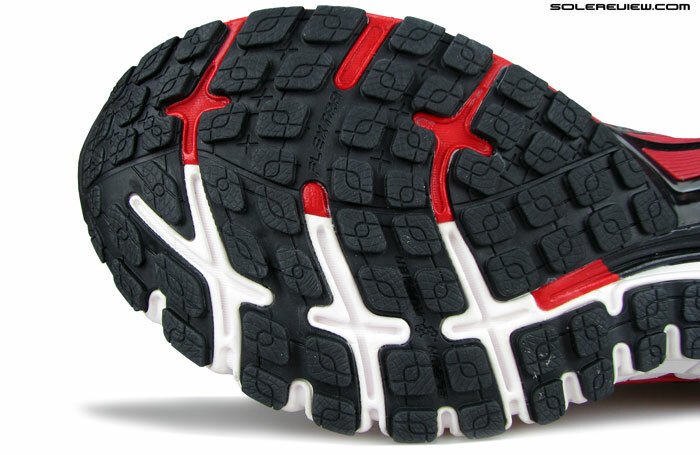 Based on just outsole wear, hard to say if stability shoes will work or not. However, if it is firmer cushioning you need with no medial post, then you could consider the Mizuno Wave Inspire 11 and Rider 18 (firmer than Inspire) come to mind. Yes, we felt the GTS 15 to run stabler than the GTS 14. Should work for lateral heel strike and roll in. GTS 14 is, like you pointed out, better cushioned than the 15. Thank you. Trying to find a lot of cushion with good support for lateral heel striker. The new Hurricane ISO comes to mind. Sorry, can’t say because we don’t have miles on the 990 – so don’t know how they compare with the Inspire 11. My first comment here, so first let me say I just discovered this site yesterday and already I’m finding it an invaluable resource that’ll undoubtedly play a crucial role in all my future decisions involving the purchase of running shoes. After a knee injury with a pair of NB running shoes last year, I switched to Brooks’ Adrenaline GTS 14. I used to run with orthotic insoles on account of zero arch and an ankle with scary medial sinkage. A guy recommended I switch to the Adrenaline 14 and lose the insoles, and I followed his advice and have been running upwards of 40K/week for a few months injury free now, breaking PRs and everything. Then my shoes supplier contacted me with a great deal on the Adrenaline 15, so I ordered. Ugh. The size isn’t an issue for me. 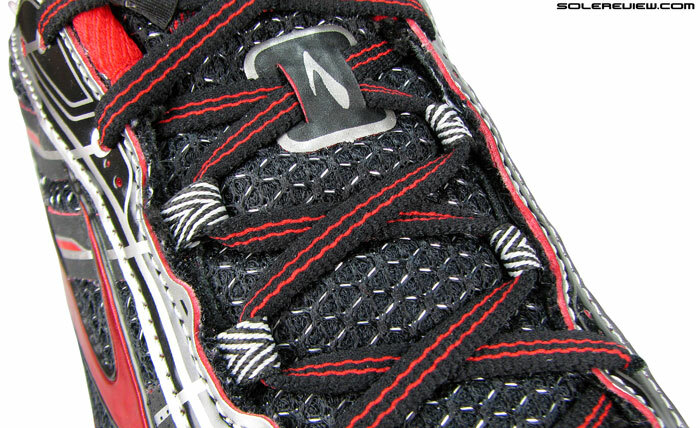 But the lacing and tongue design are a disaster, to the point where the shoes are basically useless for long runs. I tie the shoelaces all the way up, but what happens with the Adrenaline 15 is the tongue slips down and the topmost crossing and knot end up flipping under the tongue so they’re directly on my sock. This in turn loosens the lacing the rest of the way down. Brooks seem to have misaligned the lace loop as well: rather than the laces pulling the tongue upwards, they pull it down, exacerbating the problem of the tongue not being long enough to begin with. Thirdly, whereas the 14 model had a triangular lacing configuration at the lowest point, in the 15 model Brooks did away with the front-row loop, and that — as you rightly indicate in your review — makes for poorer pressure distribution. Thank you for comment, happy to read that you find solereview of some help! There are significant changes on the GTS 15 upper vs. the 14, and when put together, they don’t feel as right as the 14 did. Personally, we felt that the GTS 14 was a far superior shoe. That is always the issue with franchise shoe models. Sometimes a shoe is near perfect, and another year you could fill a scrapbook with things you don’t quite like. If the GTS 14 worked superbly for your runs, then perhaps a good idea to stock on a couple of pairs. Thank you for sharing your feedback. The GTS 15 has a different feel, no two ways about that. The GTS 14 was a gem, and good move to pick up a couple of pairs. Unfortunately that you got sold a larger size, is there no way to return it? I have an extremely wide foot (4E) and had been running comfortably in the Adrenaline series for a number of years, since the GTS 9. However, the GTS 14 has been extremely uncomfortable for me, with the midfoot area being much more cramped, and it sounds like the 15 may be even worse in that regard. Any suggestions for shoes comparable to the GTS 13 that come in a 4E width? I have struggled with heel slippage in New Balance shoes over the years, so I am thinking that the ASICS GT-2000 and Nike Air Zoom Structure may be my best options. Thanks in advance! Hi! Thank you for the great feedback. Always happy when our readers say that our reviews help. Don’t think we can help 100% here (because we haven’t tested the GTS 13, but will try. Now assuming that the ride itself was not an issue, only the midfoot fit was. In that case, Structure 18 needs to be given a pass because of a tight midfoot and Flywire based lacing. The GT-2000 3 is an option, yes, and you can also try the NB 1260 V4, Can’t think of any other shoe which comes in 4E and fits the picture. I am looking for a new pair of trainers which have the same arch support as Brooks Adrenaline GTS 15. The insole is excellent. I have very high arches and would love to use other brands too even just to walk long distance. Can you recommend any other model with great arch support? thanks for writing incredible and detailed reviews! You could try the Nike Zoom Structure 18, the Lunarglide 6, adidas Supernova Sequence 7 Boost and the Brooks Ravenna 6. We’d pick the Nike Structure 18 as the one with most prominent under-arch support. The rest are options for you to try and refine your choice-set if necessary. Been running twice in them and both times i have had really bad calf pain! dont no if thats the trainers or me but i have had to stop 5 times on each run to rub my calfs! Im happy as the lower shin pain has gone but now just an awfull calf pain! And the bridge of the foot is painfull also? Could be just the process of getting used to new shoes, but conditioning of those muscle groups also helps. What trainers did you run in before? I came from the Saucony Omni 11 that has a 8mm drop. Ran in my new GTS 15s last night and found the 12mm drop was an issue with my mid sole landing. Felt like heel hit first. Calves sore after. Difference in drop 11mm vs 8 or just new maker/ style of shoe the cause of calf pain? On the face of it, seems like the rise in heel position could have resulted in a (higher) contraction of the calf/soleus muscle. Should disappear after the body adapts to the new shoe, it usually does. Hi. Compliment for the great reviews in your website. I’m an havy runner trying to get lighter (91kg for 1.84 cm) . Current pace on 10km race: 5 min/km; 5.40 min/km at slow peace; 50 km on average week. Originally i was suggested by sports doctor to turn to adrenaline 14 after have been using glycerin plus orthotics and not been able to solve problems with annoying shin splints. I’ve now finished with my experience with adrenaline 14 (which helped me to solve shin splint) and bought the 15. Admittedly,they seems a bit harder than 14, but is too early to judge. I’m now thinking of at least siding, if not replace, adrenaline with lunarglide 6; first in speedwork and then maybe always. Would it make sense or better stick to adrenaline? Thanks! When it comes to running shoes, follow the ‘if it isn’t broken, don’t fix it’ rule. Which means if the Adrenaline served you well, then makes sense to stick to them. 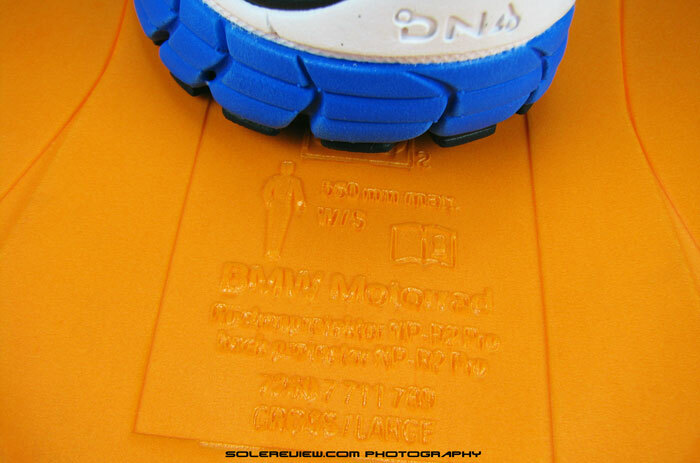 The Adrenaline GTS 14 had the DNA gel insert within the midsole, and the GTS 15 does not. So you’re right, the 15 is firmer than the 14. The Wave Inspire 11 is very nice, but it has the typical ‘Mizuno’ ride, which means a firm, controlling midsole behavior. The Inspire 11, we felt, was good was speed and building cadence. Will you like that difference, coming from a Adrenaline? Don’t know, you will come to know once you have some miles on them. The Lunarglide 6 is softer than the GTS 15 and the Inspire, so in that sense it might appeal to you. Worth waiting up for the LG7, which releases in early July. No midsole design change, but with a brand new upper. Thanks again for your time! I’ve been running in my new lunarglide 6 for a “while” (about 80 km) and completed my first half marathon at 5’14” for km in them; I can say only one thing about these shoes: so far, I love them! Eventually I feel stability (admittedly a bit less then in GTS 14 and 15) but what softness and reactivity at the same time! I really enjoy more running now! I just hope they will not cause me some new pain because now I feel I can run faster. Indeed sometime I feel some sudden little strange feeling during running but that last little and then disappear. What you think? Hope just my imagination because I feel so good in these shoes! You’re correct, the Lunarglide does run softer than the Adrenalines. If the shoes are behaving well so far, don’t see them to be potentially causing any issues. Conditioning/strengthening your muscles/tendons along with adopting proper running form and nutrition is what matters more, so if you focus on that too, most shoes will work well. Hi, I’m a heavier runner (240 lbs, 5’8″) with overpronation issues probably due to recently fallen arches (gained weight recently). I had been wearing the NB 860v3 and had been happy with it but I’ve recently developed plantar fascitis. I’m now looking for something stable and with sufficient arch support. Also, I wore 10 4E in the NB, but it is not the toe box that I need wide, it is my midfoot that is the widest part of my foot. The GTS15 standard width size 10 was actually comfortable for me in the toebox. I’m wondering if getting the 4E (which the store did not stock) will solve the midfoot width issue or does going up in width only get me a wider toebox? Also, would you recommend any other shoe? I do like the new 860V5 as well, but given that I developed the heel/midfoot issues as I was still in the 860V3, I’m wondering if I should move to something different. Please help! Thanks. A 4E width (or for that matter any width increase from B-D-2E-4E) results in a bigger upper across the widest part of the foot. This happens to be joint at the base of the big toe on the medial (inner) side and base of the small toe on the lateral side. If you’ve ever been fitted on a Brannock device, you’ll know what we mean. It’s that adjustable slider which measures whether you are a D, 2E or wider. A 4E width will also partially affect the midfoot and toe-box fitting, but whether fits well or not depends on individual foot anatomy. Is there a return option for you in your shopping location? Most websites offer a return policy. Try the GTS 4E, it will be substantially wider than standard. Thanks for the review. I’ve found that the GTS 15 is snug on my left pinky toe. I’m wearing a 13 4e shoe. Do you have any recommendations so it’s not so tight around my pinky toe? Should I remove the lace from the 1st set of eyelets, like you mentioned in the review? Personally I find the GTS 14 to be more comfortable. Yes, try skipping the first lace row and see if that works – you’re already on a 4E, so this is pretty much the last resort. And agree, we found the GTS 14 more comfortable too. Do you have any shoe recommendations that has a wide and roomy toe box? 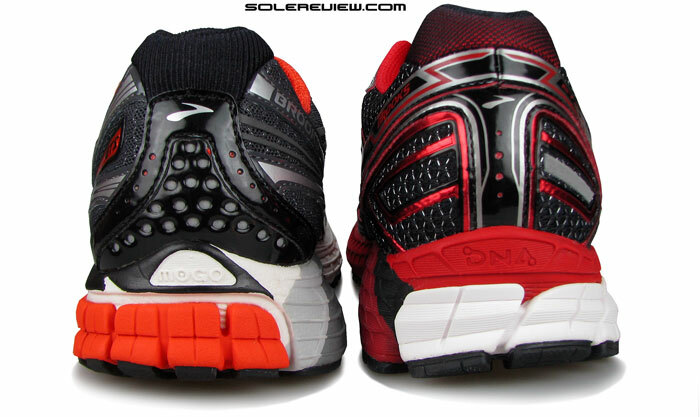 I tried the Saucony glide 7s in 13 xtra-wide, but the toe box wasn’t wide enough for me. I wear a size 13 shoe in a 4e width…currently rotate between the brooks gts 14 and 15. We’re thinking that the upcoming Nike Zoom Odyssey might do it for you, but can’t say till we review it nice and proper. it looks like they’re not due out for a few months, correct? in the interim, is there anything else you’d suggest? Actually there’re out August 4th, so not very far away. There isn’t much available when it comes to a roomy forefoot – you could give the Structure 18 or Mizuno Wave Inspire a try, though – and see whether those work. Not too happy tonight. I went to take my gts 15s off of my shoe warmer before getting on the computer when I noticed that a piece of the rubber looked like it was coming unglued from the rest of the sole. I emailed brooks a few minutes ago to see what they say…hopefully there will be a remedy as the shoes aren’t that old nor do I run in them and/or wear them daily. You should be able to get a replacement for that. Brooks finally got back to me today after supply them with some information. They’re going to send me a replacement pair of sneakers. I am a 230 pound heavy runner (recently started running) and generally do 3-4 miles daily on treadmill. I have brooks Ghost 8 and recently bought Adrenaline GTS 15 too. Ghost 8 is neutral shoe and Adrenaline is support shoe. Is it fine to use one neutral and one support shoe? I am thinking this might make different muscles to work and make them strong. But some people suggest not to mix neutral and support shoe. What are your thoughts on using both neutral and support shoe? We’d say don’t worry about the shoes, unless they feel uncomfortable. 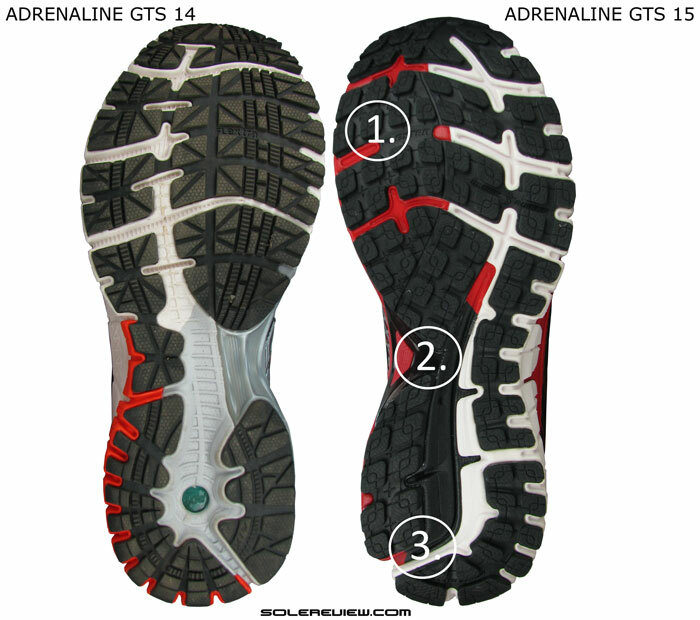 Besides, the Adrenaline GTS 15 is fairly neutral in its cushioning behavior, with an overall supportive nature. So it is ok to alternate between neutral and support shoes. I am planning to use them both. Adrenaline feels comfortable (in fact feels less tired in them) but have some pain near Achilles tendon (after running). It has been only 3-4 days since I started using them. Will use them for another week to see if pain goes away. I don’t get that pain in Ghost 8. I have recently developed plantar fasciitis so bought Adrenaline GTS 15. I hope it will help me overcome plantar fasciitis. I have low arches. Would it matter if shoes are for low to medium or medium to high arches? Do you recommend any show insert for low arches which provides good arch support and helps in plantar fasciitis? Yes, we see no harm in alternating both. Regarding your Achilles soreness – how much space do you have in front of the toes for the Adrenaline vs the Ghost? Can’t say whether the GTS will help your PF. Recovery exercises+scheduled rest days, or whatever has been prescribed by your doctor would help. On the arch subject, we see a higher or lower level of support as mere sensory placebos. They feel nice and supportive for some runners, while for other they might feel invasive. Go with what fits and rides best. 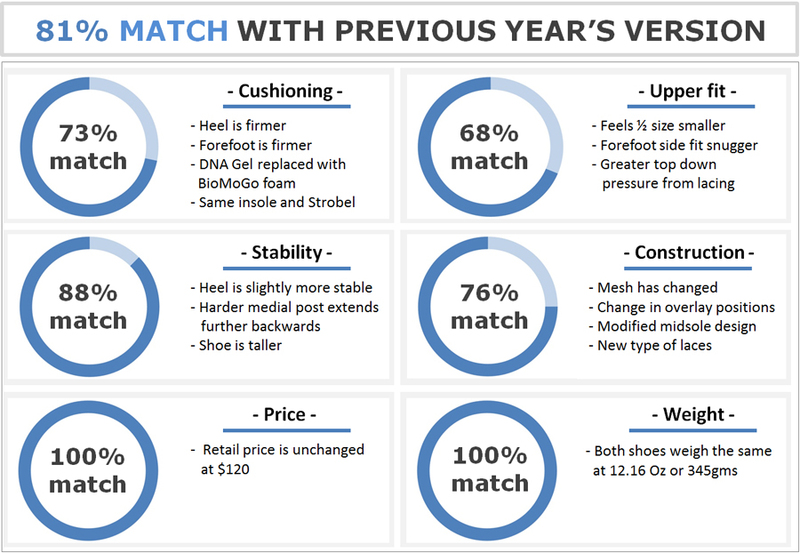 Don’t have any recommendations for orthoses, though one day we plan to review different aftermarket insoles and their compatibility with shoe models. Custom made orthoses usually help in achieving the desired level of support and cushioning, but then the needs are purely subjective. Both Ghost 8 and Adrenaline GTS 15 are size 13. Ghost 8 has more space in front of the toes than adrenaline. Adrenaline seems to run half size smaller and 13 might be equivalent to size 12.5. There is no 13.5 in Adrenaline so I had to go with size 13. During runs, I do not feel my toes hitting the end of the shoe (there is some space between them). so I thought it is fine, It has been a week since I started using adrenaline on daily basis, Achilles tendon soreness seems to be getting better, Hopefully it will go away. Regarding PF pain, I am now stretching calf muscles before and after run, also during the day at regular intervals. It seems to help me as heel pain is alleviating. I don’t know if it is support shoe Adrenaline or stretching, which is helping in PF. I think for now, I will not use any insole. If needed, probably it will be a good idea to go for custom orthotics. Any idea when are you going to review Brooks Ghost 8 and Saucony Ride 8? Your reviews are detailed and really helps. The sizing issue is precisely the reason why we asked the question. Since the GTS runs smaller than the Ghost, it is possible that the heel fit is tighter, and puts pressure on your Achilles base. There are specific exercises targeted to condition the plantar fascia; your physio should be able to help. Ghost 8 and Ride 8 should be reviewed soon, most certainly in August. We’ve already had these for a while, but reviews take a lot of time. I have a pair of GTS15 and after 6 months the uppers have started to wear away and my big toe and little toes are starting to show though! The uppers are starting to wear away where the shoes crease and Im not a hughe runner….not fit for purpose! That should make a case for replacement/refund, ideally. Just got a pair from the local, longstanding and highly-regarded running shop, even though I am not a runner (bad knees, and now chronic PF). I’m 6’1″, 201 (average, just a tad overweight). I am in a rounded half-size up, but they put me in a NARROW, stating these shoes run wide and that a narrow is really equivalent to a medium width by other shoe’s standards. Your very thorough review here seems to contradict this claim. Did I get a bum steer and should I return these shoes before they show wear? (yes, my toes feel a little cramped, especially walking downhill). That appears to be an incorrect assessment of the shoe by the LRS staff. The Adrenaline GTS 15 isn’t wide at all. You should get a normal width instead, if the narrow feels uncomfortable. Thanks – somehow I just now got replies to my Disqus questions and comments(???). Anyhow, I did bring the shoes back and they explained that the prior year’s version ran wide and that most people found the narrower size to be like a “normal” width and that;s what they carried most of ion that show. Long story short, they replaced my narrows with a new model-year “regular” which is quite nice. Interesting – had no idea! So gait analysis for me revealed overpronation, flat feet, and I’ve always had very narrow feet. I used to run in the Gel Kayanos 17 and 18, and really disliked the adjustments they made from 19 and above. I switched to the New Balance 1260v5 this year and after 2 months developed calf issues. I recently bought the Brooks Adrenaline GTS 15 at the suggestion of a running store attendant after a discussion about my running style and recent pain. I’m normally a size 11 in all shoes, but in the Brooks, my foot slid in the 11, so I went with the 10.5. In the 10.5 I have slightly less than a thumb’s width distance from my big toe to the front of the shoe. I went on 1 run with them last evening (2.5) miles and every so often I could feel my toe touch the front of the shoe. This morning I have slight shin pain. Should I go with a larger size? I’m guessing the shin pain is due to a brand new shoe, I’ve never experienced this before. Not sure what’s causing the shin pain – though a thumb’s width is the ideal spacing margin, the lack of it might not necessarily be the reason. Take a couple of days off, let the pain subside completely, and go for a run again for the same distance on the third day. If the pain flares up again, then you know it is the shoe or the sizing. Is it an issue that during the run my toe sometimes hits the front of the shoe? Overall they feel extremely supportive. Yes, the sizing is small. Sorry but the new adrenalines are a pile of poo. Why did brooks mess them up?!? I’m running in adrenalines since 2003 and went through, like, 25 pairs over the years: 700 miles on the clock, go to shop, new pair, repeat. Perfect. Until 2014 that is when I suddenly noticed that the size has changed. My usual size 10 became three quarters of a size too small. Wtf? Of course I noticed only after having shelled out £120, and after having caught painful blisters. I’m running in sauconys guide now. Still missing the old adrenalines though. I still can’t get my head around why brooks f**ed up a perfect show. We personally liked the GTS 14 far better than the 15. Try and get the adidas Sequence 7 Boost or Saucony Guide 8 (both last year’s model) for cheap. Awesome. Thanks! What if there are no shoes available/change my mind and perhaps get the new models? What would you recommend then?